Are dinosaurs described in the Bible, in the book of Job? Q. I heard that dinosaurs are mentioned in Job. If so, can you explain? The LORD’s first speech from the storm addressed two important concerns arising from Job’s opening speech. The LORD countered what Job said he wanted to do—un-create the day of his birth—by depicting the glories of the creation thriving and pulsating with life. The LORD also spoke to why Job wished he’d never been born. Job felt that his life wasn’t worth living if there was no coherence between his most deeply held beliefs and his actual experiences. The LORD showed him that his experiences were in fact coherent with a more profound and mysterious vision of the world, in which the cause and explanation of events within the human sphere may lie outside that sphere and may never be completely understood. Job responded to this first speech by admitting how limited a grasp he had of the world’s workings. The LORD illustrates the limitations of Job’s power by describing two great beasts, which he calls behemoth and leviathan. Many interpreters believe that these descriptions are initially of the hippopotamus and the crocodile, two fearsome river creatures known from the Nile in Egypt. Simply by comparison with these, Job has to admit the limits of his own power. But the LORD then draws an even stronger contrast. Halfway through the long depiction of leviathan, after a significant transition in which the LORD warns against rousing such beasts and mentions Job’s case against him, the portrait moves from realistic to mythological. Leviathan now takes on the characteristics of a fire-breathing dragon and comes to represent the chaos monster. As the speech ends, the LORD describes humans trying every weapon they have against this monster—swords, spears, arrows, stones, clubs, etc.—to no avail. Leviathan swims powerfully off into the deep unvanquished, leaving the seas “churning like a boiling cauldron” in his wake. So how does Job think he can rouse this monster but then get it to stop destroying God’s creation after it has turned only one day of the year into chaos? But even though Job believes that the chaos monster can be called upon selectively to undo specific aspects of the creation, the LORD explains that even behemoth and leviathan are not his eternal enemies, existing independently of him and forever opposed to his purposes. Rather, they are magnificent creatures of his own design and are under his power. 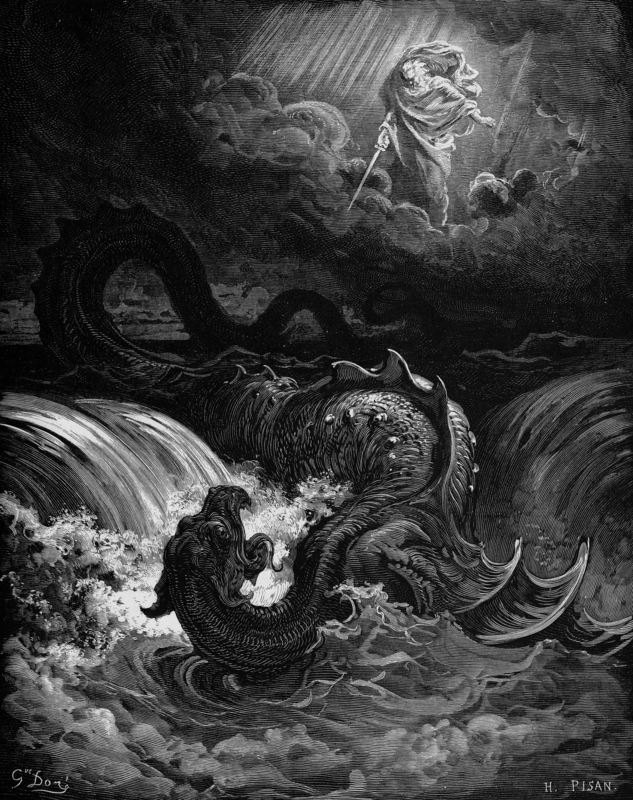 God says that as behemoth’s Maker he can “approach it with his sword,” and he refers to leviathan as a “creature.” “Everything under heaven belongs to me,” he tells Job. The universe is not a battlefield where two opposing forces are locked in perpetual combat. Ultimately God controls everything, even forces of destruction that people are powerless to resist. In other words, the descriptions of behemoth and leviathan are not of dinosaurs. They begin as poetic but realistic descriptions of actual animals, probably the hippopotamus and the crocodile, and they then move into mythological symbolism to make points that serve the larger themes of the book of Job. I hope this explanation is helpful to you. Previous Previous post: Are there really “prayer bowls” in heaven? Next Next post: Does the reading of “sky” for “heavens” in the Genesis creation account rule out the creation of invisible, spiritual things?